Want to try new Fruits and Vegetables? Make a game of it. By: Kimber Sarver. 4-H Extension Agent. Next time you go to the grocery store, use your phone to take a picture of all the unfamiliar fruits and vegetables. If you have children or grandchildren, this could be a great job for them to do. Remember that this “adventure” will take a little more time and patience! Make sure you also include their food names. When you get home, use this website http://edis.ifas.ufl.edu/features/fruitvegindex.html for information and accurate photos. Some of the posts have recipes; and, of course, you can do a separate internet search for particular recipes. 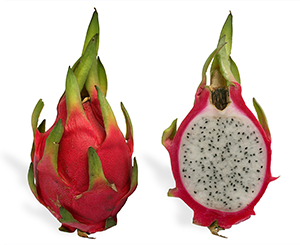 Pitahaya or Dragon fruit. Example of a fruit that you could find in your local supermarket. If you are a parent or grandparent, use your children to help create this game. First, print out important information about the fruit or vegetable. If possible, print out the photo and a recipe! Glue this to a large index card. Leave one side of the index card blank. Make as many cards as you can. Tell your children that each week the family is going to try a new fruit or vegetable. Place the cards blank side up and have your children randomly select a card and that will be the new fruit or vegetable of the week! For added fun and adventure, find some ethnic grocery stores in your area. Oriental, Latin, and Caribbean grocery stores often have a wider variety of unfamiliar fruits and vegetables. This game could turn into a great school project. Your kids could journal their new food experiences. They can write a speech or a poem. They can make this a science fair project by digging deeper into nutrients, calories, and more. If they enjoy art, they can practice drawing the new food. And, if they are like to take pictures they can start a “New Foods Selfie” photo album. Truly the opportunities are endless. If you are in 4-H already or would like to become a 4-H member, these are the fun and informative projects we love to encourage. If you would like to find out more about becoming a 4-H member, please visit http://miami-dade.ifas.ufl.edu/4h/. Kimber is a 4-H Youth Development Agent at UF/IFAS Extension in Miami-Dade County.